ACOUSITIC VERSION TO BE RELEASED IN JAMAICAN ANTI-VIOLENCE CAMPAIGN. Guitarist Lamont ‘Monty’ Savory is hoping for a Crime-Free Christmas and has already started putting plans in place to ensure that fellow Jamaicans share in that dream. The crime situation currently grappling the island has weighed heavily on Savory’s mind, especially in recent times, as the gruesome killing spread to the nation’s children. With his connections in the music industry, the band member from C-Sharp decided to use the entertainment platform as a way to reach out to Jamaicans to spread his message of peace, using the faces of some of the country’s most popular entertainers to spearhead the campaign. Christopher Martin, Tessanne Chin, Busy Signal, Agent Sasco, Duane Stephenson, Tarrus Riley, Protoje, Chronixx, D-Major, Tifa, Konshens, and Kevin Downswell were all enlisted by Savory to be part of the initiative. The campaign, which will be largely driven by social media, will see the artistes recording their own renditions of popular Christmas songs or carols or integrating aspects of their own music with a Christmas flair. Monty told The Sunday Gleaner that he decided on this particular initiative because of how influential music can be. He also went on to say that the entertainers involved in the project did not hesitate when asked to come on board. “Everyone had the same response. Everyone said, ‘yes I’m definitely 100 per cent down for this idea’,” he said, sharing that many of them heaped praises on him for taking the first steps to making a difference in Jamaica. He also said that the project would not have got off the ground if it were not for the team he was working with. 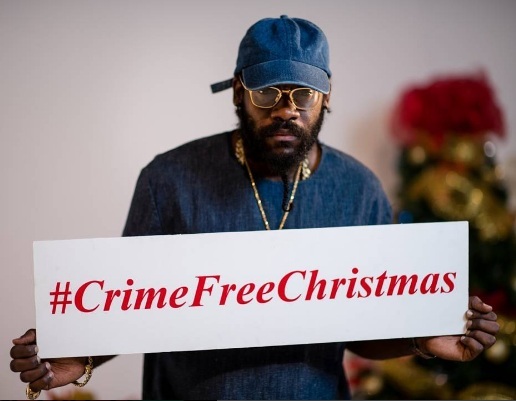 A Crime-Free Christmas will be launched on December 1, and a video for each song will premiere every day until December 12. Though the initiative gets started as a Christmas project, Savory hopes that the message will extend beyond the Yuletide season. The project is sponsored by several corporate companies, including Tropical Metals Limited, Wisynco Brands, FLOW, and the Child Development Agency (CDA).